“All I had known for certain when I came around the hen house that first evening in July and saw my husband trudging into the yard after lifetimes spent away from us, a borrowed bag in his hand and the shadow of grief on his face, was that he had to be protected at all costs from knowing what had happened in his absence. I did not believe he could survive it.” When Major Gryffth Hockaday is called to the front lines of the Civil War, his new bride is left to care for her husband’s three-hundred-acre farm and infant son. Placidia, a mere teenager herself living far from her family and completely unprepared to run a farm or raise a child, must endure the darkest days of the war on her own. By the time Major Hockaday returns two years later, Placidia is bound for jail, accused of having borne a child in his absence and murdering it. What really transpired in the two years he was away? Inspired by a true incident, this saga conjures the era with uncanny immediacy. Amid the desperation of wartime, Placidia sees the social order of her Southern homeland unravel as her views on race and family are transformed. 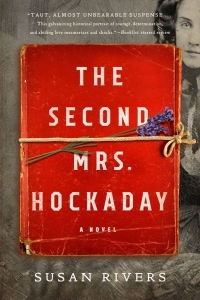 A love story, a story of racial divide, and a story of the South as it fell in the war, The Second Mrs. Hockaday reveals how that generation--and the next--began to see their world anew. “TAUT, ALMOST UNBEARABLE SUSPENSE . . . This galvanising historical portrait of courage, determination, and abiding love mesmerises and shocks.” - Booklist (starred review) now in paperback.